As the biggest holiday of the summer approaches, we are knee-deep in red, white, blue. And why wouldn’t we be? The 4th of July is the time to beam with patriotic pride! Some of us are hosting get-togethers and barbecues, and some are heading elsewhere to celebrate. Regardless, we’re all excited and ready for fireworks! Kids in particular are ready to revel in this quintessential summer event. They’re out of school and have plenty of time to get a little party planning going with Mom or Dad, especially when there’s candy involved! 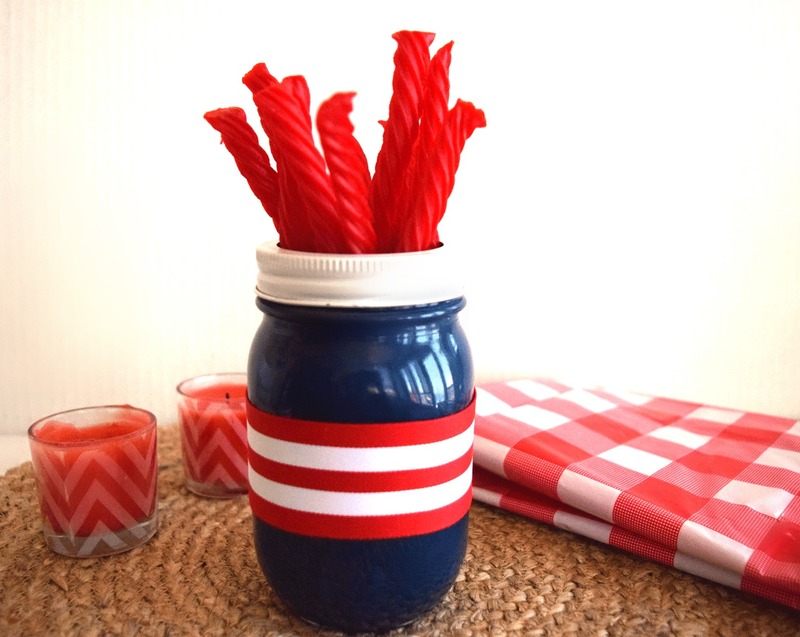 This year, we made Patriotic Treat Holders for our dessert table. They couldn’t be easier to make, and I just know they’ll be a big hit with our guests, especially the kids! Ask your child to help you put together these Patriotic Treat Holders before the big day! 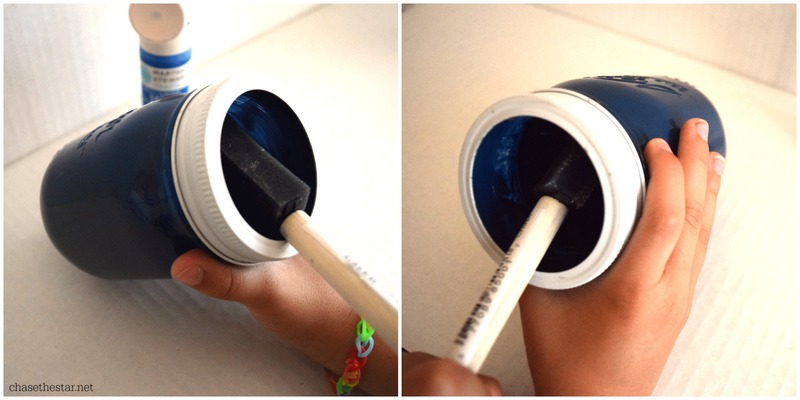 Have your child paint the inside of the Mason jar blue, and the lid white. It may take several coats of each color to fully cover–make sure they are allowing for drying time between coats. 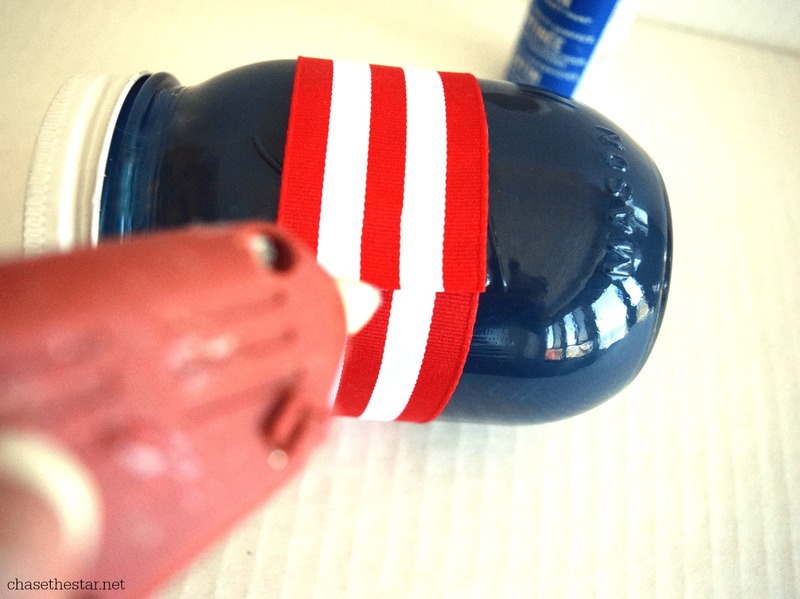 *Use the hot glue gun to secure the ribbon around the Mason jar in one clean strip, trying to get the stripes to line up. If you can’t find striped ribbon, the use red and white ribbon strips, and secure in the same way. *I do not recommend for kids to use the hot glue gun without adult supervision. Once the jars are totally dry (overnight is best), line the bottoms with a folded paper towel and fill the jars with bright red licorice! Set several of these around your dessert table, or at the kid’s table. They’ll love to brag about how they helped make them! If you’re not hosting this year, these make great hostess gifts! How do you get your kids involved in summer crafting?